The first baking mixer was a standing mixer invented by Herbert Johnson, an American engineer for the Hobart Manufacturing Company. The inspiration struck after Johnson watched a baker work laboriously on mixing bread dough with a metal spoon. 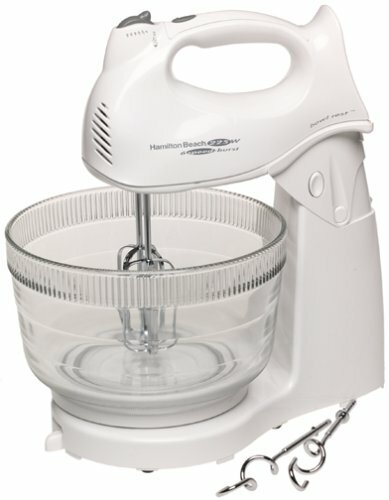 By 1915, Hobart sold 80-quart mixers to professional bakers. In 1919, Hobart introduced the first 5-quart countertop stand mixers called KitchenAid that weighed 65 pounds and sold at a steep price. In 1936, designer Egmont Ahrens redesigned the KitchenAid mixer into its lighter and iconic Streamline shape which also made it much more affordable to the masses. 1. Up to 4.5 qt. Stand mixers are easily identifiable because they have a mixing bowl on top of the bass with a variety of attachments that can attach over the bowl to mix up a variety of doughs and batters. They’re incredibly beneficial for busy cooks who need an extra set of hands in the kitchen, as you can simply put the item that you need to mix into the bowl of the stand mixer and then walk away while it mixes for you. Additionally, because stand mixers have been built to last, it is much more difficult to wear out the motor on them as you can on a hand mixer. While they are significantly more expensive than hand mixers, they will likely last for years before having any problems. Another benefit of using a stand mixer is that you do not have to worry about how evenly your ingredients are incorporated. That’s because the stand mixer will turn the beater so that every bit of your dry and wet ingredients are thoroughly mixed together. You can choose from a number of different speeds so that you can slowly incorporate flour or quickly whip up whipped cream. By choosing from a number of different attachments, you can make sure that your ingredients are mixed together perfectly. Not only can you choose from a dough hook, balloon whisk, and paddle to mix your batter and dough, but you can also choose from a number of different attachments that can do everything from grinding grain to rolling out pasta. Unfortunately, in addition to being very expensive, stand mixers are also quite large and heavy. If you do not have dedicated space in your kitchen for your stand mixer, then you will find that it is quite difficult to move it from one location to another whenever you need to use it. People who use their stand mixers a lot like to have them out on the counter at all times so that they are easily accessible, but this does require a fair amount of space and will decrease useable space on your countertops. Hand mixers are significantly smaller than stand mixers and also have detachable hooks and beaters that are very easy to clean. Due to their smaller size and weight, they are very easy to pick up and use, no matter what items you need to mix. 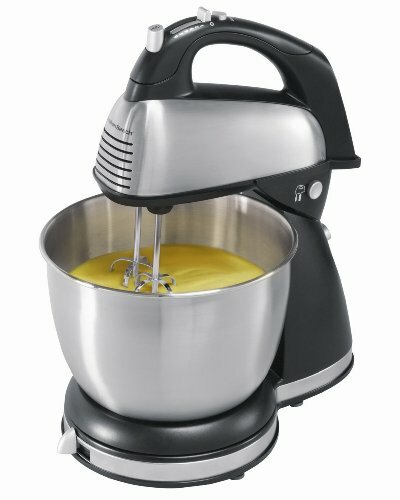 The person using a hand mixer simply has to hold the mixer over the bowl and then control the movement of the mixer to make sure that all of the ingredients are thoroughly combined. While they are very small and compact, they’re also generally very powerful and many hand mixers offer different speed settings for you to choose from. This ensures that you never use a speed that is too fast or too slow for the work that you are trying to do so that your food turns out the best way possible. Unfortunately, while there are a number of benefits to using hand mixers, their smaller size means that they do not offer the pure power that stand mixers do. It’s normal to wear out your hand mixer on accident if you are mixing up a lot of bread dough or thick batters on a regular basis. Another problem with hand mixers is that they require the person using them to stand there and help guide them. 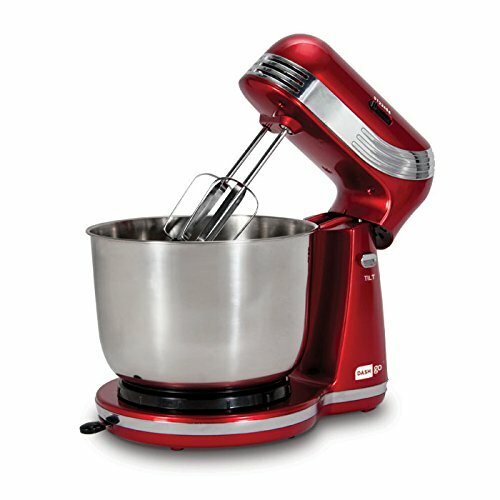 Unlike stand mixers where all of the ingredients can be dumped into the bowl and then left to mix on their own, using a hand mixer is a dedicated task and requires full attention. Tilting the bowl while you are mixing can also result in a mighty mess, unlike stand mixers that usually have a guard that you can attach to prevent major spills. While hand mixers often come with interchangeable whisks and hoax, they do not have the advanced attachments that you can get with a stand mixer. While not nearly as popular as hand or stand mixers, manual mixers have their place in some kitchens due to the ability to quickly mix smaller portions of ingredients in them and because they do not require electricity to run. They are usually made of a heavy-duty plastic and have a crank on the top that allows you to quickly mix and beat your ingredients, without having to use a spoon or whisk. Additionally, because they are so portable, they are perfect to take with you camping or on a picnic so that you can have fresh whipped cream or mix up a quick dressing or sauce while you are out of the kitchen. Sometimes homeowners want to have the best of both worlds of a hand and a stand mixer, in that case it is possible to buy a combination mixer that can be used in both ways. These mixers are a combination of a lightweight hand mixer that can attach to a stand to create a stand mixer. This type of mixer will easily convert from a stand to a hand mixer with the press of a button, making it easy to switch between the two appliances as you need them. It’s important that you make sure that the combination mixer you choose is powerful enough to stand up to thick and heavy doughs, as you are likely to want to use this appliance to mix your bread. Another important consideration is the size of your mixer, as you want to make sure that you have room to store it. Luckily, unlike regular stand mixers, this type of mixer will break down into two parts that are smaller and individually easier to store. One feature to look for on a stand mixer is a tilt-head. This allows the user to easily add additional ingredients into the bowl of the mixer, without having to lower the bowl in order to create enough room to add the ingredients. When you use a tilt-head, you do have to stop the mixer so that your ingredients do not spill out everywhere, but tilting the head back allows enough room for you to easily add items such as butter, flour, or other flavorings. Not all stand mixers come with this feature, but if you regularly cook or bake recipes that are very involved and have a number of steps and ingredients to add at a later time during the mixing process, then this feature is one that you will definitely want to consider. While more and more people are interested in having modern and updated kitchens, there are some people who prefer the retro look. One way to make your kitchen look more retro, while still ensuring that it is completely functional, is to buy a mixer that you leave out on your counter that is in the retro style. These mixers will work just as well as other more modern ones that you can buy, although they may not have all of the attachments or speed options that you have come to know and love. When buying a retro mixer, it’s important that you make sure that the wiring is connected securely, so that you don’t have to worry about the mixer shorting out during use. It’s very common, when you have been mixing, for your bowl to become very heavy due to the dough or batter that you have inside. If you want to make lifting it as easy as possible, then it is important to opt for a bowl that has a handle. Unlike bowls without handles, this feature will make it significantly easier to lift your bowl off of the mixer and move it to another area in your kitchen. This is also beneficial if you are mixing very cold ingredients and do not want heat from your hand to negatively affect your final dish. It is very common to have to add ingredients later in a recipe, but doing so without care can result in a major mess in your kitchen. One way to combat this mess and the possibility of that occurring is to opt for a stand mixer that comes with a pouring shield. This shield easily attaches to the top of the bowl so you can carefully pour in your dry ingredients without worrying about them being scattered all over your countertop. When shopping for a stand mixer that has a pouring shield, you will want to make sure that it has a wide enough shoot for you to add vast quantity ingredients in at the same time. This will ensure that all of your ingredients are mixed together evenly and prevent you from having to add ingredients such as flour, a tiny bit at a time. Some mixers come with an optional soft start feature that allows you to add your ingredients without worrying about creating a giant mess when you turn on the mixer. When you use this feature you will be able to start with a full bowl of ingredients and not have to worry about spills. The soft start feature slowly turns on your mixer at a very low speed so that your ingredients can become incorporated fully, before beating them in faster. This ensures that nothing gets stuck to the bottom or the sides of the bowl and will decrease the chance of a mess. One problem with hand mixers, in particular, is that it is very easy to lose the attachments when your mixer is not in use. Instead of fumbling through your drawer looking for your beaters or your hooks, when you opt for a hand mixer that has built-in storage on the sides for your beaters you won’t ever have to waste time searching for them. Your beaters will easily snap in and out of this storage so that you can quickly pull out your beaters and mixers at the same time. This will also ensure that your beaters are never damaged and won’t drop back behind a drawer so that you cannot find them. When you are finished cooking or mixing up your dough for baking, it’s normal to want to skip the cleanup process because this just adds extra steps and it can take so much time. Instead of allowing your mixer parts to soak until a later time or becoming frustrated because you have to wash them by hand when you opt for a mixer that is dishwasher safe you will be able to quickly toss all of the parts into the dishwasher to be cleaned. This ensures not only that everything is cleaned correctly to your high standards, but also prevents you from wasting a lot of time and water by washing them by hand. If you are not going to be doing a lot of cooking or mixing and don’t need a particularly high-powered mixer, then a hand mixer that only has three speeds may be an okay option for you. These mixers will not be able to beat at incredibly high speeds, but they are ideal for regular mixing jobs. Hand mixers that have six speeds will give you more power than mixers that have fewer speeds, and they are great for cooking multiple different types of food. You can rely on them not only for mixing up sauces, but they are also usually powerful enough to handle cookie dough. Unfortunately, even their strongest speed may not be powerful enough to deal with bread dough. Stand mixers are generally going to have the most speeds out of any type of mixer, so choosing one that offers many different speeds for you to choose from will ensure that you can correctly mix, whip, and beat anything in your kitchen that you are making. Slower and lower speeds are best for beginning to incorporate your items together and for gently whisking ingredients, while faster speeds are perfect for whipping whipped cream into peaks, as well as incorporating a lot of air into your egg whites. When you choose a Stanton mixer that has 12 or more speeds, then you will be able to easily adjust how fast your mixer is mixing so that you don’t have to worry about your food being over or undermixed. The size of your mixing bowl will play a huge role in how much you are actually able to mix in at one time. If you have a very small family or prefer to cook in small batches, then you will not need a mixing bowl that is particularly large, as this just takes up extra room in your kitchen. Additionally, using a mixing bowl that is too small for your task can make it difficult to fully incorporate all of your ingredients evenly, and will often require you to finish the mixing with a whisk or a spoon by hand. Larger mixing bowls are ideal for being able to make large amounts of food at a time. If you regularly cook for parties or have a large family, then you will need to choose a bowl that is slightly bigger. It’s important to make sure that you do not overfill your bowl, as this can cause the motor on your mixer to become overheated. Understanding the right amounts to put in your mixer will ensure that you do not have any problems with your food being mixed completely. Stainless steel is probably the most popular type of material used for bowls on stand mixers, and for good reason. It’s incredibly attractive, will last for a very long time, and is unlikely to dent or become damaged if you drop it. You can easily scratch the inside of these bowls, but this is mostly cosmetic damage that will not affect the way your bowl functions. An added benefit of using a stainless steel bowl is that if you’re going to be whipping very cold items such as the ingredients for ice cream or whipping cream, you can place the bowl in the freezer beforehand to ensure that it is nice and cold without risking damage to the bowl. There are a number of reasons why you may want to use a stand mixer that has a glass bowl. Not only does this ensure that you can easily make sure that all of your ingredients have been incorporated, without having to stop the mixer and use a spoon to look down into the batter or dough, when you use a glass bowl you don’t have to worry about it being damaged by ingredients. Unlike stainless steel that can easily become scratched and nicked if you have sharp or hard ingredients added to your mixture, glass is very durable and unlikely to become damaged. The problem with glass is that if you do drop it, it can break, and buy a replacement bowl may be difficult or expensive. Additionally, it’s not a good idea to put your glass bowl in the freezer to make it nice and cold for whipping up cool ingredients, even though this can help to stabilize the mixture you are making. A dough hook is very important if you are going to be using your stand mixer to make bread. Unlike paddles or balloon whisks, a dough hook will mix all of the ingredients for your bread, without breaking the strands of gluten. Building up the gluten in your dough is the best way to get a bread that has a solid structure and a good rise, which is why you always want to make sure to use this particular attachment when mixing your ingredients. Some hand mixers also come with dough hooks, but if you are going to choose this type of mixer it’s important that you keep an eye on how hard your equipment is working, so that you do not burn out the motor when making bread dough. Sometimes while you’re mixing ingredients they will tend to get stuck to the side and it can be very difficult to use a spatula and scrape down the edges of the bowl. 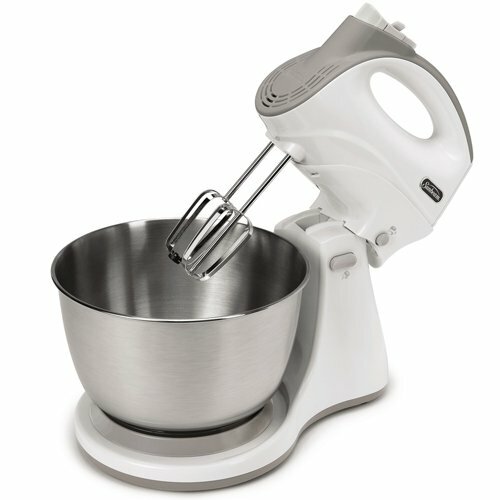 Instead of having to worry about stopping the mixer and either tilting up the head or lowering the bowl to be able to scrape down the inside of the bowl, when you buy a mixer that comes with a flex edge beater, this beater will automatically scrape down the bowl each time it goes around and mixes. This ensures that everything is incorporated evenly and prevents you from having to worry about using a spatula to remove ingredients that are stuck to the side of the bowl. Both stand and hand mixers will regularly come with a whisk attachment that can be used in place of regular beaters or other hooks. A whisk is a great way to quickly whip up a very light batter, whipped cream for on top of a desert, or froth eggs. Make sure that you choose a whisk that is made of stainless steel and is not so tight that it will be difficult to clean once it is dirty or that ingredients are unable to pass through the sides of the whisk for even mixing.